A month ago I visited my eye center to renew my prescription of contact lenses as I do each year. During this visit I always have the Optometrist take pictures, etc. This visit she came into the room and announced to me I had Macular Degeneration. At first I was in shock and confused as to what it even meant. 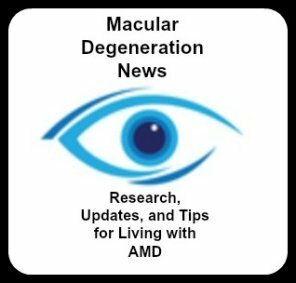 I really have only heard about Glaucoma and Cataracts but never thought about Macular Degeneration - but knew by the sounds of it, this was not good. She gave me an grid to look at which I saw fine. My vision is 20/20 in both eyes and this is a total shock. She did not seemed concerned and told me to come back in a year as it would take years to ruin my eyesight. I asked her what could be done and she mentioned the AREDS 2 study and suggested using the supplements which I did that night. I began to start to worry as she gave me no information so I started my internet research and was shocked. Now I am very afraid and panicked at first. I next went to visit the local retinal specialist who performed more detailed tests, OCT and one with dye in the arm and more pictures. He was very nice and confirmed to me I had intermediate ARMD in both eyes. That was even worse than I thought so thank goodness I had the intuition to seek better medical advice. He told me to come back in 6 months, do the grid everyday and take the AREDS 2 formula. He told me it could stay as is for years or develop overnight into WET ARMD. I am still worried and ask others, how do you travel with the fear the MD could turn into WET at any moment. I understand you are supposed to get right into the Dr. for eye shots. Wonder if I were out of the US and could not get home for several days? I now wake up every day and wonder If I will be able to see. I have no symptoms at all and have no issues with reading or distance vision. I play a lot of tennis and exercise regularly and eat very healthy. I am just in shock that I have this disease as no one in my family ever had ARMD. I am very scared and do not know what to expect. It worries me that a year ago at the eye exam it was perfect with no issues and today intermediate ARMD. Thank you for any comments you could share. Betsy, I, too, went to the Dr. on Friday for a follow-up since I had LASIK done on both eyes back in July 2017. He proceeds to tell me I have early stage AMD (dry)...was shocked...he asked if I had any questions for him...couldn't think of any and he didn't really provide me with any information. I don't know what to think right now...I'm quite angry that I paid for LASIK and now, not even a year, this pops up! Anyway, btw, I'm 49 and scared as I live alone. I pray that you and I and everyone else suffering from this disease will find peace and continue to live life to the fullest. Betsy, same thing happened to me. I went in for eye check up in Feb. 2018, and was told I had drusen. Optometrist also told me to take AREDS2 and use the Amsler grid. And come back in a year. No signs or symptoms. I myself did go to a retina specialist, but waited till the following year ( mistake). He also told me I had intermediate dry AMD and to come back in 6 months. I was not given the test where they put dye in your vein, just the dye in your eyes and they took a lot of pictures. Very scared and trying to be positive. I have good days and bad days. I am trying to stay positive. I just wonder if there are a lot of people who have dry AMD that doesn't progress. Thanks. I was just diagnosed yesterday. I am 53. Everyone is asking me: how long? Your information was helpful and hopeful. I can understand your unease, but allow me to tell you that, like so much else in life when the problems become reality, you just do what you have to do. My first sign was n 2000 and lost my left eye to wet AMD in 2011. Since then i have functioned quite well. The injections didn't work, and with one functioning eye I can do everything. The right eye is fine but with some cataract problems but those are treatable. It may not seem logical, but your anxiety is about something that hasn't happened and may not for some time, if at all. Hello - I write here for my mother who is 91 yrs old and was diagnosed with AMD over 40 yrs ago. She still has some sight and is still able to be independent. She does not drive however. She always ate her veggies and a great diet that has helped her maintain vision for many years. It wasn’t until she was around 86 yrs old that her vision changed to where she couldn’t drive anymore. (She couldn’t see the lines in the road anymore). I know you think that I am not the one with MD, but I will say that fear has never been a driving force for my mother. She practiced prevention and lived for the day. After over 40 yrs, with MD, (dry form), she still has vision. She uses a cane now to help her ambulate - and the cane has worked out well as it acts as a "third eye". She worked with a vision specialist who came to the house to help her use the cane properly and help her to navigate in her home and use her appliances with the use of other aids. I know this is not what you want to hear at this point, but don’t forget we are talking many, many years of living with MD before she had to use aids to help her. Knowledge is power in this case and take it a day at a time. Don’t be hard on yourself as worry adds to stress and stress is not good for anything. Stay positive and practice good health. It does help.